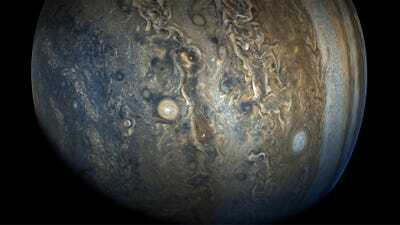 Travelling above Jupiter at more than 310,000km/h, NASA’s $US1 billion Juno probe took its ninth set of stunning flyby images on October 24. 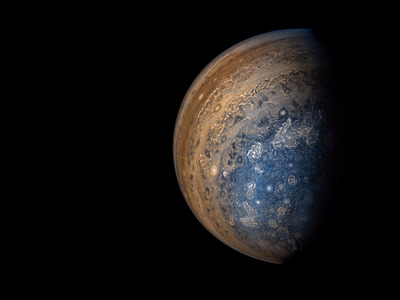 But the sun slipped between the giant planet and Earth for more than a week, blocking the spacecraft from beaming home its precious bounty of data. 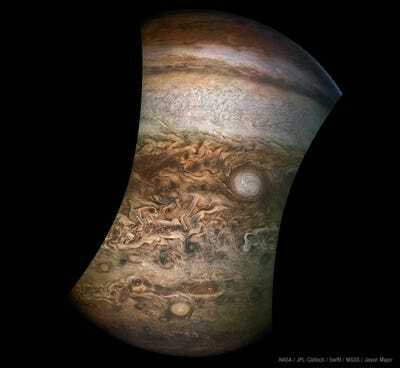 Now that the conjunction is over, however, new raw image data from Juno’s ninth perijove — as the spacecraft’s high-speed flybys are called — has poured in. 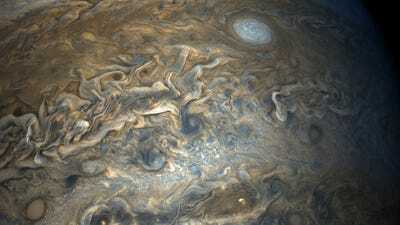 Researchers posted it all online on Tuesday, and a community of amateurs and professionals has been busily processing the data to yield colourful and stunning new pictures of Jupiter. 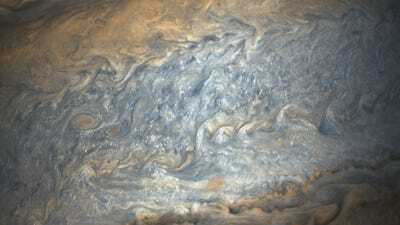 The spacecraft then swept within a few thousand miles of the gas giant's cloud tops, capturing stunning high-resolution views of its cloud tops. 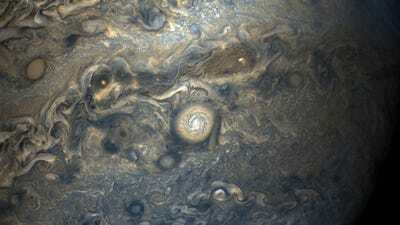 Then Juno flew back out into deep space, passing over Jupiter's south pole on its exit. 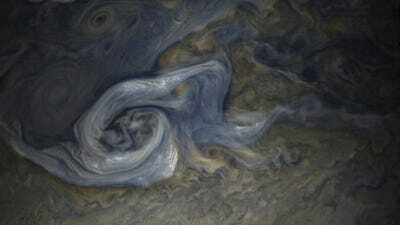 Clouds at the top and bottom of the planet constantly change due to churning storms. 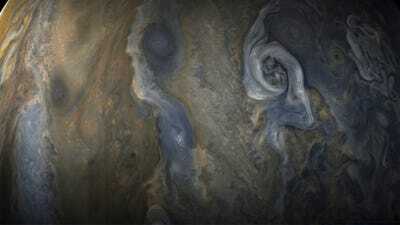 Juno pulls off this manoeuvre, called a perijove, about every 53 days. Then researchers upload the raw data set to the mission's website. 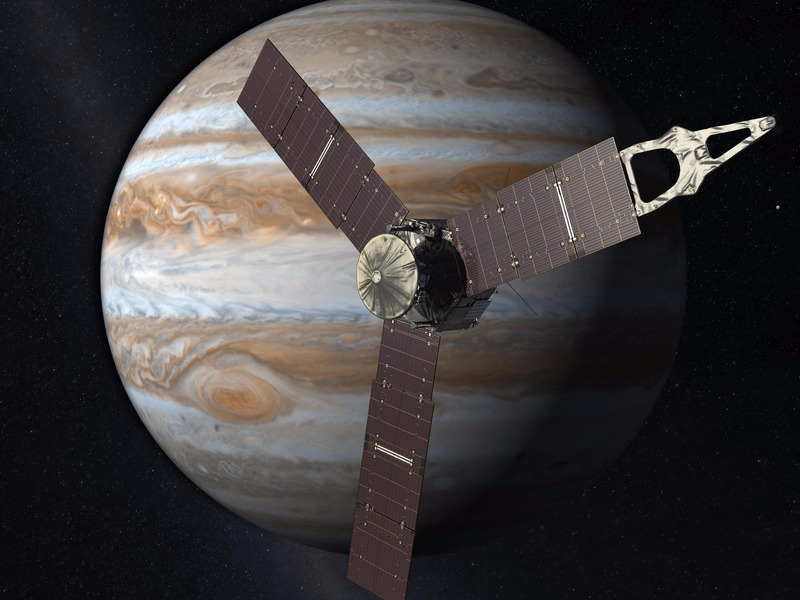 Juno was supposed to speed up and fly by the gas giant planet every two weeks, but a sticky engine valve prevented that manoeuvre. Enthusiasts take the drab, mostly grey image data and process it all into true-to-life colour photos. Many take on an artistic quality. 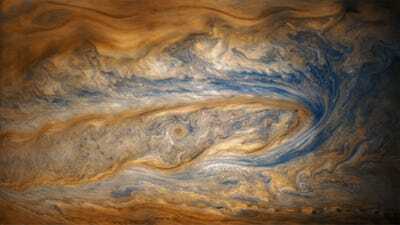 Others dazzle with their detail of Jupiter's cloud bands and storms. Some of the tempests are large enough to swallow planet Earth, or a good chunk of it. 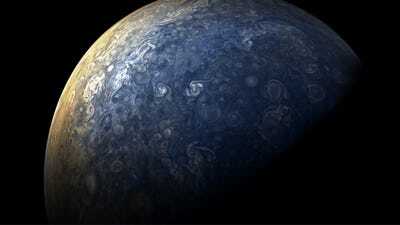 There are also traces of molecules like ammonia, methane, sulphur, and water. Other times, shining white flecks of clouds fill up most of a band. Many cloud bands have features called chevrons. 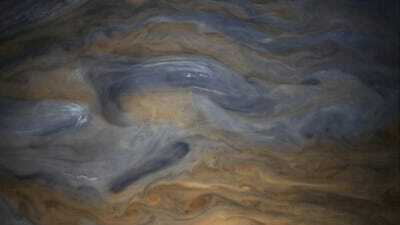 These atmospheric disturbances blow at several hundreds of miles per hour and sometimes zig-zag through the band. 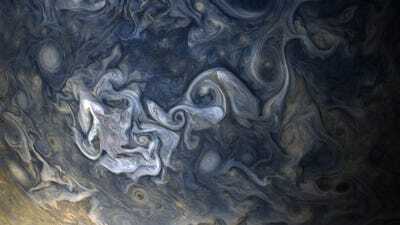 In this older view of Jupiter from the eighth perijove, two cloud bands battle for dominance -- one of which contains a swirling storm many times larger than a hurricane on Earth. 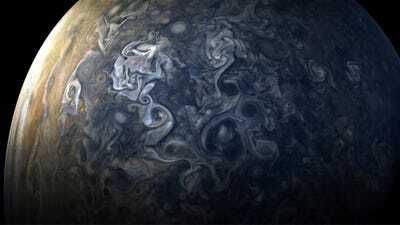 Artist and space enthusiast Seán Doran often animates Juno's images into videos that provide a sense of what it's like to fly past Jupiter's cloud tops. This one's from the eighth flyby. 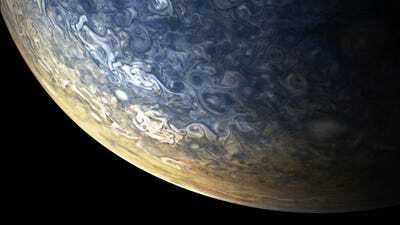 NASA will eventually destroy the $US1 billion robot. 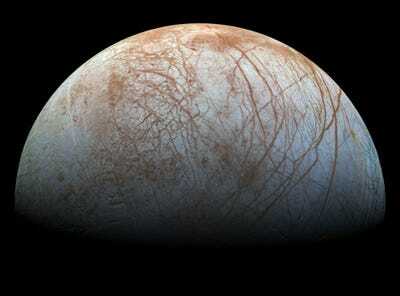 That way, it can't accidentally crash into Jupiter's icy moon Europa and contaminate an ocean there that may harbour alien life.